Dynavent Smoke Ventilators are natural louvered ventilators manufactured from tough corrosion resistant aluminium alloy and are available in a wide range of sizes and control options suitable for most industrial and commercial buildings. These highly efficient and extremely versatile units come with a variety of impressive features and are very easy to maintain. Dynavent Smoke Ventilators are extensively tested and certified to EN 12101-2:2003 in acrredited third party test laboratories and is CE marked. For more information on Dynavent Smoke Ventilator, Please Download Catalogue Here! Aerodynamically tested as per EN 12101-2:2003, Annexure B.
Dynavent natural smoke ventilators have been successfully tested by Warrington Certification Ltd UK in accordance with the procedure specified in EN 12101-2:2003, Annexure G which requires that the ventilator opens fully with no closure, partial reclosure or distribution which would reduce the throat area by more than 10%. When subjected to heating condition of 300° C for 30 min. 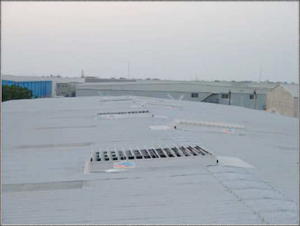 Dynavent Open Sky Roof Ventilators are classified to Re1000 as per EN12101-2:2003 Annexure C.
The product is classified under WL1500 as per EN12101-2:2003, Annexure F.
A wide range of control options (electric) are available. Can be fitted easily to any flat roof or glazed construction. Can be installed at any angle, the bases are suited to either glazing or any prepared opening at sites. In-house trained engineers can provide a pre-order design service. Press formed mill finished Aluminium 1.4 mm thick. Mill finished Aluminium, 1.4mm thick. Mill finished Aluminium, 1.4mm thick, double skin insulated models are also available upon request. Self lubrication nylon to ensure maintenance free operation. Dynavent is manufactured under ISO 9001:2008 quality standard and each unit is given a functional test before despatch. To keep escape and access routes free from smoke for evacuation of people. Facilitate fire fighters by creating a smoke free layer. Protects the materials inside the factory/warehouse to reduce financial losses by preventing smoke logging. Delays/prevents flashover and sunsequent full development of fire.